Thanksgiving is a time of feasting and gathering of friends and family to celebrate the bounty of this country and its future promise for all. This autumn, as I was visiting Cambridge, MA.and walking in the neighborhood, two turkeys,male and female, were also walking in the street and then along a sidewalk. Naturally, I wanted to catch up with them and we walked along for a block or two . Astonishingly, they seemed to have no fear of cars or humans. At one point , I thought the turkeys would follow me back to where I was staying or maybe get lost. So I walked ahead, looked back at Mr. and Mrs. Turkey, and then continued my way back to my lodgings. Oddly enough, these turkeys also stopped and then turned back and trotted on home. All this is to suggest that a Thanksgiving meal does not have to include turkey meat. See the link below for some scrumptious recipes from the New York Times food section, that are vegetarian. Enjoy! 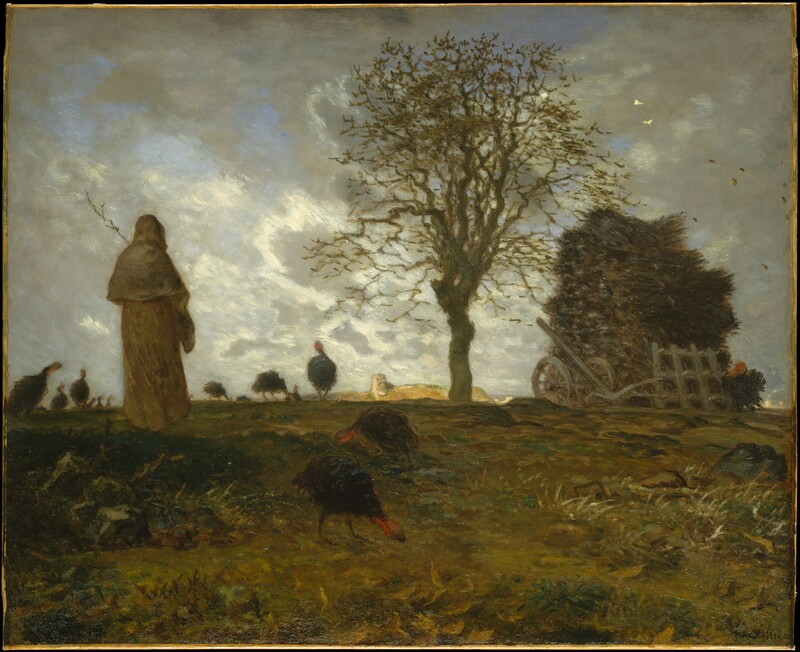 Autumn Landscape with a Flock of Turkeys, Jean-Francois Millet, 1872-73, oil on canvas,collection of Mr.and Mrs.Isaac D.Fletcher, Gallery802, TheMetFifthAve. Next PostNext Is the Ocean Blue?